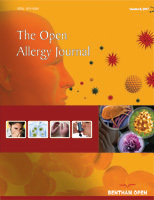 The Open Allergy Journal is an Open Access online journal, which publishes research articles, reviews, letters and guest edited single topic in all areas of clinical and experimental allergy. The journal accepts original research articles, letters and review articles written in English. Supplements, proceedings of conferences and open access book reviews may also be considered for publication. This journal publishes open access reviews on recently published books (both print and electronic) relevant to the journal. Publishers and authors of books are invited to contact our book reviews editor at toallj@benthamopen.net with book review requests. All submitted books will be reviewed by an independent expert in the field. No page charges will be levied to authors for the publication of book reviews. All authors must strictly follow the guidelines below for preparing illustrations for publication in The Open Allergy Journal. If the figures are found to be sub-standard, then the manuscripts will be rejected.